Beat This Caption Contest 216 Winner – Caption Contest Funny Clever Witty Enter Today! 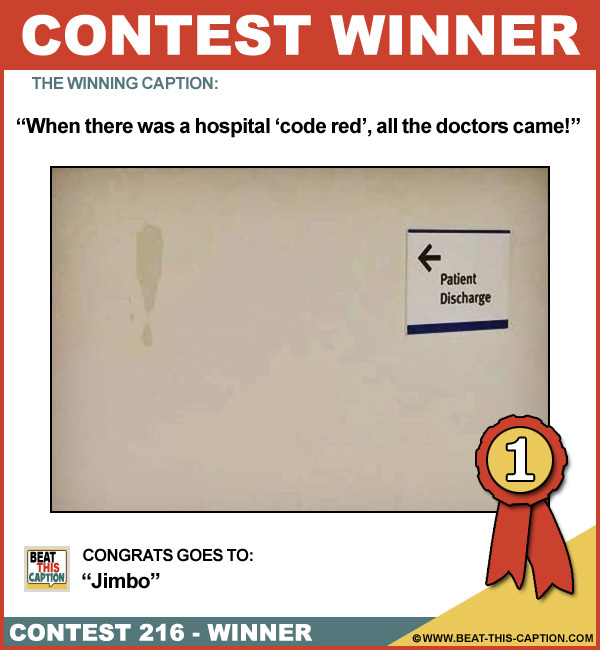 When there was a hospital ‘code red’, all the doctors came! Great Caption! So if you’re ever in the hospital and your heart stops, close your eyes and mouth! :) You Win! Hold that elevator… I’m coming! If you stare at it for 30 seconds then look away…you can see Jesus! If I’d had a bit more time I could have done a question mark! I used to only hit the baseboards. Thanks, Viagra! After the surgery Chaz Bono just couldn’t wait to get home to try out the new equipment! Holy confusion!! After being discharged from the hospital patients headed to the exit didn’t know if they were cuming or going! Running out of specimen jars left them with no other option!